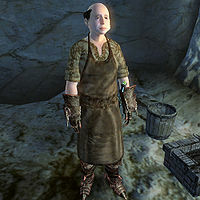 The Weapons Apprentice is one of two apprentices of the Drothmeri Army's Forgemaster, the other being the armor apprentice. He wields a blade in combat and wears heavy boots and gauntlets, both of which are leveled. He also wears blacksmith's pants and a blacksmith's apron. He carries a repair hammer at all times in readiness for work. He seems to have a rivalry with the other apprentice: one of them has sent their master a note accusing their counterpart of skulduggery. He is able to repair items, though he is always hostile. This page was last modified on 25 January 2014, at 22:41.